DESIGNED FOR THE WORLD’S BEST GAMERSExperience exceptional performance, immersive entertainment and simple convenience with 9th Gen Intel Core processors. The i5 9600K processor extends all the capabilities that users love from previous generation CPUs with even more advanced innovations that deliver new levels of performance immersing you into your computer on a variety of form factors. The 9600K features all the latest Intel technologies to allow you to have the best computing experience, and this particular CPU is unlocked allowing you to overclock it to your gaming or production needs. EXCEPTIONAL I5 PERFORMANCEThe 9th Generation Intel Core processors redefine mainstream desktop PC performance. The i5 9600K features six cores for more processing power. The Unlocked feature on this chip allows for overclocking enabling you to tweak the performance. Intel Turbo Boost technology has also increased the maximum turbo frequency of 4.6 GHz, and it features up to 9 MB of cache memory. The 9th gen i5 processor allows you to enjoy excellent gaming and VR experiences. put yourself in the game A high-performance processor is key to achieving a balanced platform to make your VR experiences great. Attach your premium head-mounted display (HMD) to an Intel Core i9, i7 or i5 processor based PC, and prepare to be amazed. The performance of the 9600K processor allows for a very smooth virtual reality experience. Keep in mind that great VR experiences involve the entire platform, not just any one component. The ideal combination of processor, graphics, I/O connectivity, display, and audio are required, but be assured that this 9th Gen i5 Intel Processor won’t let you down. Intel Core i5 9600K, S 1151, Coffee Lake Refresh, 6 Core, 6 Thread, 3.7GHz, 4.6GHz Turbo, 9MB, 1150MHz GPU, 95W, Box is rated 4.8 out of 5 by 6. Rated 4 out of 5 by HBRT from For gamers only Its do what is design for. Nothing less nothing more. Rated 5 out of 5 by AndrewM from Good upgrade from an i7-920 It had to be time to upgrade from an i7-920, and this seemed to be a reasonable replacement. Installation was easy. I am using it in an Asus Prime Z390-A motherboard with a Noctua NH-U12S cooler and 16 GB of Corsair Vengeance LPX 3200 RAM. This is definitely an improvement on my old system - games such as Crysis run much more smoothly, and Windows 10 is that little bit snappier. I am definitely pleased with this CPU. Rated 5 out of 5 by Relype from Silicon Lottery First time buying CPU from Scan computers and I would say this is the best place for buy items so far. I got 5.1 Ghz with 1.29V, and I can still lower it. Strongly recommend this website and this CPU! Rated 5 out of 5 by DangerousYute from I5 9600k/GTX 1070 Ti This CPU performs amazing for the value dropping only 4-6 fps on average vs the 9700k in BFV and other triple A titles. I am running a Corsair H60V2 and the cpu runs at a smooth 60 degrees celcius and the GPU isn't far off. Would definitely recommend for gaming orientated builds. 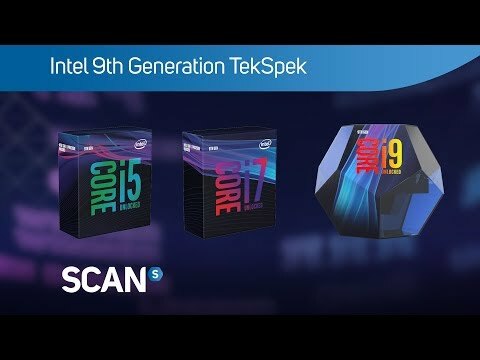 Rated 5 out of 5 by banana999 from Great CPU While not much of an upgrade for anyone with an 8th gen Intel CPU, those building a new computer should definitely consider this. Decent performance improvements over the 8600k but the main thing is that it's pretty much at the same price as the 8600k. It is also £100 less than the 8700k and £130 less than the 9700k. Is it worth that much to get hyperthreading or 2 extra cores? Personally for gaming I think that this is the sweet spot, but if you have the cash go for the 9700k. Overclocking potential is pretty good with all 9th gen CPUs and mine can go 5Ghz at 1.335V with temperatures under 80. Overall solid CPU and I would recommend this for any mid-high range gaming PC. Rated 5 out of 5 by AA94 from Just a little tiny step from the 8th gen. I have upgraded from a i5-4690k that I built four years ago. Got this set up with a corsair h100x aio cooler. idling at 25 degrees, getting decent temperatures when gaming. No problems setting it up on a z390 board. Overall, a good cpu so far for the money paid. May aswell get the latest gen instead of an 8600k due to the price difference being so little. Would this fit in a tuf z370 plus.